His Highness the Aga Khan and Professor Diana Eck in conversation at Harvard University on 12 November 2015. 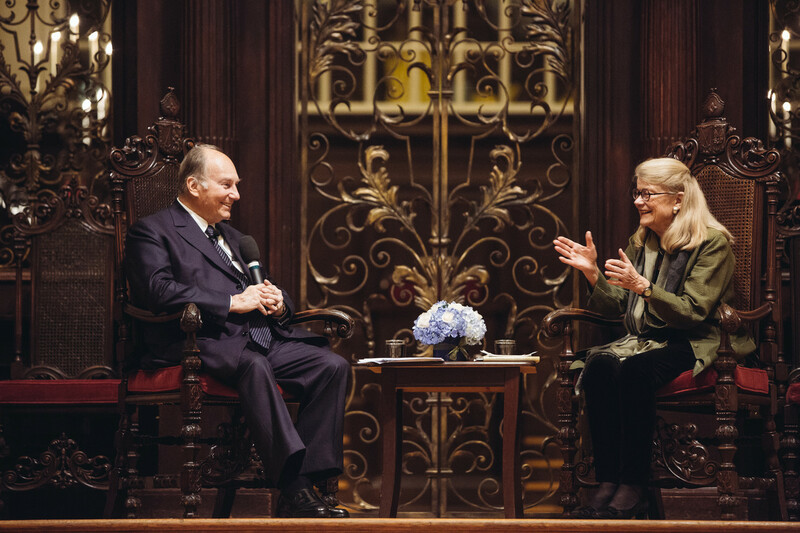 Cambridge, MA, USA, 12 NOvember 2015 - After delivering the Samuel L. and Elizabeth Jodidi Lecture, His Highness the Aga Khan sat down with Harvard University Professor Diana L. Eck for an on-stage conversation. Diana L. ECK: Your Highness, thank you for that speech. It was a great pleasure to listen to, and I think I feel especially honored because there are hundreds of people here who would like to be asking you questions this afternoon, and I’m the person who is sort of appointed to do so, and I am delighted and deeply honoured. ECK: You ended with what is a remarkable theological foundation of pluralism. You began with the political situation of the world, and the multicultural situation of the Ismailis. So from all standards you have a basis for underlining pluralism as one of the most important issues in our world. But I think the theological understanding is one that may be new to many people who think primarily in terms of the practical issues of day-to-day life. AGA KHAN: Right, right. Well I think that’s absolutely correct, and in fact this notion of one humanity in the faith of Islam is a very, very powerful force. But it’s not always presented in the form that I tried to present it today. And it is there, it is clear for those who wish to see it and understand it, but not all Muslim societies take that on board. ECK: Well, it is interesting because Jewish, Christian and Muslim societies all are founded on theological principles that stress the oneness of God and also that begin with the theology of creation in the way in which you had. So there should be — and I think there has been — a kind of theological reaching out. I think especially of the Amman Declaration that you were part of, and of the message that was delivered called A Common Word Between Us and You, from so many Muslim leaders to Christian leaders across the country. AGA KHAN: I hope that is true. I have been watching in parts of the world that has become a thought process. I am fearful of the parts of the world where that is not part of let’s say government philosophy, but I think that in time this understanding of unity of human society will end up by being seen as a condition sine qua non of good governance. I think you will see governments fail because they do not practice this principle. They will have so many divisions within them, so many attempts at achieving positions of power by certain groups or influence by others, that it will be impossible to create a sense of nationhood, a sense of building around common values, which after all is what most governments would wish to have. ECK: I think one of the most striking things about the writings you’ve done on these issues and speeches like we’ve heard today, is your relentless linking of issues of poverty and education and human development with the foundation of pluralism as you’ve just articulated. AGA KHAN: Well, if you try to analyse the causes of poverty in the developing world, as we have tried, there is absolutely no doubt that the marginalisation of communities is one of the fundamental causes of this poverty. And this marginalisation is so structured in society that minorities find it very difficult to break out of that situation. And the work that you are doing here in your field of pluralism, teaching about pluralism, having people understand that it is not a threat, on the contrary it is a foundation of civil society in the modern world. These things I think are absolutely essential. I think the more we have seen societies work, which are fractured, putting little groups of people in one box or another box, that is a way of guaranteeing conflict and poverty. ECK: One of the things I think that we take from this, is because your Centre for Global Pluralism really looks at global issues which are so important, it also is the case that so much has changed in the United States and indeed in Canada and indeed at Harvard, since the days that you were in Leverett House with two secretaries, and that is the tremendous movement of people as migrants, as refugees from one part of the world to another, and in the US with the 1965 Immigration and Nationalities Act the opening of the US to immigrants really from all over the world, so that’s really changed the face of Harvard, and the message that you bring is one that is very relevant to universities today. I’m not sure how large the Harvard Islamic Society was when you were here. AGA KHAN: Well in fact, it didn’t exist I think until Sir Hamilton Gibb came to teach here at Harvard. My recollection is that he was the juried professor of Islamic Studies at Oxford if I’m not wrong and he came to Harvard from Oxford and he started the program here at Harvard. But that’s my recollection — that’s a long time ago. ECK: You know the thing that’s amazing today, as you would walk around Harvard you would see dozens and dozens of women going just from here to Leverett House wearing hijab, that you would find a very active Islamic prayer space just next door, in one of the floors of the freshman dormitory and some places were the Juma prayers every week are in the largest lecture halls where they can remove all the chairs. So the transformation of our university from being a rather parochial university in some ways, to a global and cosmopolitan university is something that has not only to do with the fact that people come here from all over the world, but that our own nation has changed so much and these issues of marginalisation that you speak of, that are divisive in so many ways, are issues that that America faces profoundly in dealing with race and culture, and indeed with a multi-religious society. AGA KHAN: Well I’m deeply pleased that Harvard has, is moving towards what Harvard wants to be, even when I graduated. And I remember President Bok telling me extensively about, how he was seeing Harvard becoming a global university rather than a US university. That was in his mind at the time, the goal for this university, and what you are saying today is that that goal is in the process of being achieved. So I have to say well, alhamdulillah. ECK: Well it’s been achieved but we haven’t really moved in some ways from what our current President Drew Faust calls the necessity of moving from diversity to belonging. To a sense of really creation of a community that is respectful of our differences, which are so many, and that move, I think one of the profound things that I hear you say time and again is that pluralism doesn’t just happen by itself. It requires a certain amount of conviction and support of institutions across the spectrum of civil society. AGA KHAN: I think that’s absolutely right. And indeed I would encourage education on pluralism even in secondary education and in fact neuroscientists are saying that newly born children recognise the pluralism of other children being next to them in a cot even if they can’t see the child. So the individual, the human individual, has extraordinary means of sensing somebody who is from a different society. But that sensing has nothing negative in it. It’s a constatation — I can’t find the word in English, but you know what I mean. So I find that very, very exciting that when children are born the notion of differences in background or race, is not at all a feature which has value attached to it, neither negative nor positive. It’s aconstatation. ECK: That issue that you have raised again and again, that our differences are part of the richness that we bring to life, we could say from a theological standpoint that’s a God-given difference from scattering of people from this one soul. AGA KHAN: But I have to nonetheless point out that many countries in the developing world where we have been working were governed on the principle of divide of communities. For years we worked in countries where the educational system was African, Asian or European. There was no single educational system in those countries. So that is the phenomenon which people have inherited even today and which is difficult to overcome. I can remember situations where hospitals were not entitled to take people of different backgrounds. ECK: In the development network that you have created spanning the world, I know education is a very big piece of this, from the Aga Khan Universities to local education that must be a daunting task. A few years ago, your daughter Princess Zahra was here and spoke at the Harvard School of Education about her role in this with a great attention to women’s education. I’m not sure if that is a particular emphasis that you bring, but it certainly is one that is profoundly important. AGA KHAN: Well my grandfather in fact pushed very hard to have women’s education as part of our overall educational process, so that’s part of the way we think, the way we live today. Now you were talking about universities etc. And it’s clearly a critical issue that in the developing world, the universities should upgrade their performance and that their degrees should be recognised, that their research should be of global importance and I was taught when I came to Harvard that plagiarism was a bad thing, well I am here to plagiarise (laugh) and I don’t hide it from Harvard. ECK: When you talk about the cosmopolitan ethic that emerges from this recognition of difference and yet a foundation in human oneness, the elements of that are what? What would you say are the elements of a cosmopolitan ethic? AGA KHAN: I think the first of all you need to accept the premise that human society is pluralist, and it has been pluralist for as long as we know about the human race if I’m not wrong. So there is a basic premise that has to be accepted, that issue of accepting pluralism also means that you need to attach equity to that notion. If there is no equity in pluralist societies, then you don’t have functioning pluralist societies, you don’t have institutions that function properly etc. And I have admired a number of governments in developing countries for example, where without saying it, they have fought very hard to create equal opportunity for various communities in various parts of the country, whereas that was not the case in colonial societies. AGA KHAN: Equity would certainly be one element. ECK: And a respect for justice would be another piece of it? AGA KHAN: Respect for justice and I would say equal opportunity for the intelligentsia… I have seen situations where there has been an attempt to marginalise the intelligentsia of a given community and that of course is an extremely unwelcome feature of a society. ECK: One of the things I recall from having been involved with interfaith leaders, not that I am one myself, but I’m an observer of these events, was the effort over a number of years ago, to create a global ethic, out of the distinctive ethical norms of different religious traditions and even of secular traditions and there were certain things everyone could agree on. And I think equality, justice, opportunity, dignity, etc. were very much agreeable. When it came to what equity meant, I hesitate to say the biggest issue in equity among these dignified religious leaders was the issue of women and men, and whether gender equity, whether that really meant gender equity. It seems to me that is an issue to a great extent and yet my own impression of the Ismaili community is that leadership in Jamatkhanas and other elements of the Development Network and leadership in these positions is shared by women and men. Am I right about that? AGA KHAN: Absolutely, and in fact I have spent considerable time trying to make sure that whether it’s leadership amongst women... the community could benefit from that. Leadership qualities is not gender driven so actually, if you don’t respect the fact that both genders have competencies, outstanding capabilities, you are damaging your community by not appointing those people. ECK: So as we think about, I’m thinking now about the kind of responsibility that you have both for the spiritual as well the material well-being, the welfare of the Ismaili community — but as you put it, it’s not just the welfare of the Ismaili community but those with whom they share their societies as well. ECK: So in those, are there societies in which you find it almost impossible to have leadership of women in your own community rise? AGA KHAN: No, not really I think. I think people tolerate our decisions, I’m not sure they are always welcome (laugh). ECK: That seems to have struck a chord here. AGA KHAN: No that would not be tolerated. ECK: We were very impressed with her here. But we have not met your two sons. AGA KHAN: Well she is the first member of my family who’s received a University degree. So she is an important member of my family because the gender balance is all now Harvard related. (laugh) Not Radcliffe. ECK: One of the things that has been so, I’m sure very much on people’s mind, is that to intentionally cultivate pluralism in a society, there are some societies in which the civil society and our educational institutions are welcoming of this. But of course, pluralism within our own religious communities is often a very difficult thing, and I speak as a Christian who knows perfectly well the number of anti-pluralists there are within the Christian tradition and people who are convinced that the only possible way of conceptualising religious truth is through the lens of the Christian tradition. This also is probably true in the Muslim tradition and the effort that must be made to cultivate the kind of appreciation of mutual respect and difference is certainly a huge task. AGA KHAN: I would strongly agree that pluralism is a subject that is taught; it’s not instinctive in a human society. AGA KHAN: It’s not instinctive. So I would strongly support any initiative at any level of age that is from the newly born child up to the post-graduate student, that there should be continuous exposure to the notion of pluralism in society. It’s much easier with children obviously than with grown ups. But to me, it must be a feature of any modern society in any part of the world. I can’t travel in any part of the world today, without observing the amazing mix of backgrounds of people today that wasn’t there years ago. And that is happening more and more through happy events, unhappy events — you can see what is happening with refugees today. But I am more worried about societies preparing themselves to accept foreigners. That’s not a big story of success in my mind. The only country that I can think of that actually has a process is Canada. ECK: And you have lived certainly in France, and have deep connections in England as well. And you have seen the ways in which they are struggling with the diversity of their own societies. AGA KHAN: Absolutely and for different reasons, but they are struggling, and in many ways I consider them somewhat unprepared. ECK: I think the preparedness here in the United States is also very much, I mean the Pluralism Project has been studying the changing religious landscapes of the US for 25 years. And I think, along the lines of your point, if I had been teaching Kindergarten in Houston, Texas, I would have realised far earlier how much our society had been changing. But it wasn’t until till the 1990s that the children of this new immigration came to college and began transforming our own demographic and university in which we live and teach. AGA KHAN: Well I think that your point is very important, because what you are effectively saying is awareness in United States of the issue. I am thinking of countries where there has not been that awareness until much too late. ECK: Yes and among some Americans as well, even though scarcely, you can’t really find a state in the US where the Muslim and Hindu and Sikh presence hasn’t become a significant one. But still, we hear this in some of our public leaders this is only a slow dawning awareness. They sometimes don’t like it, as well. AGA KHAN: Yes, I realise that, but I mean I think these are people who are thinking against or in contradiction with a roadmap that you can extend from history and you extend that road map and you reach the correct conclusions. ECK: You have often said, and I think it’s right, as we look at the world today that the instability and divisiveness of societies is infectious, and at the same time you say so is hope. So can you give us in conclusion just a sense of the infectiousness of hope from your experience. AGA KHAN: Well, I think I mentioned in my comments, to me one of the most important issues for society in any part of the world, is that it should be driven by hope. The moment that people of any generation, of any age, lose hope, it is a very, very damaging thing for that community, that society. So creating circumstances of hope, is to me very, very important indeed. And much of the Aga Khan Development Network their work is to try to assist countries to become countries of opportunity. That is one of the main goals that I have is that as many countries where the community is living should be countries of opportunity. Definition of opportunity of course is a different thing, but a life that sees itself with no opportunity is a very, very sad prospect. ECK: Your Highness this has been a great pleasure to have the opportunity to speak with you and thank you for your return to Harvard for this afternoon. Thank you very much and may you come again and again. AGA KHAN: Well thank you for your generosity and your questions.